Kadapa District Anganwadi Posts Recruitment 2019: Anganwadi Workers(AWW) , Mini Anganwadi Workers, Anganwadi Helpers(AWHS)/Aayas Posts in Kadapa District: Women, Children Welfare Department, Kadapa District, Andhra Pradesh has issued Anganwadi Workers and Helper Posts 2019 recruitment notification for filling up the vacant posts of Angawadi Workers, Helpers, Mini Workers in the Kadapa District. 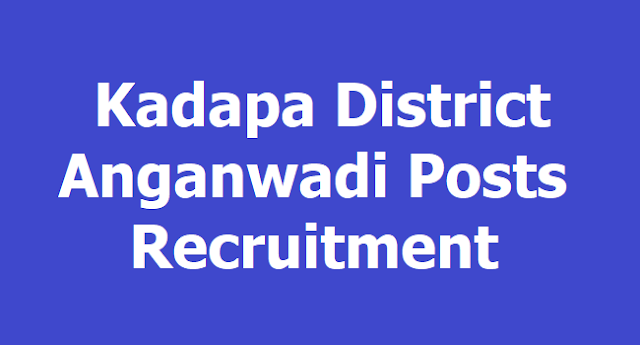 Department for Women Development & Child Welfare, Kadapa District invites applications for Anganwadi vacancies. Age: Minimum Age 21 years & Maximum 35 years as on 01.07.2018. How to apply: Completed applications forms should be sent to relevant CDPO Office. Last date to apply: 15.02.2019.